The “moulinet” is twisted of 6 or 12 cottonthreads. More thin threads are needed for lace making. They can be made bysplitting (untwisting) the “moulinet”. Manual untwisting does not prove to besimple as it seems at first sight. It becomes just clear that an operator oughtto have the third and fourth hands. In other words this work can not be donewithout an assistant. stop splitting every time whenthe next part of “moulinet” is being pull out of the clew. It ought to keepstrictly the rule – avoid excessive touching the thread by fingers to save itscleanness. 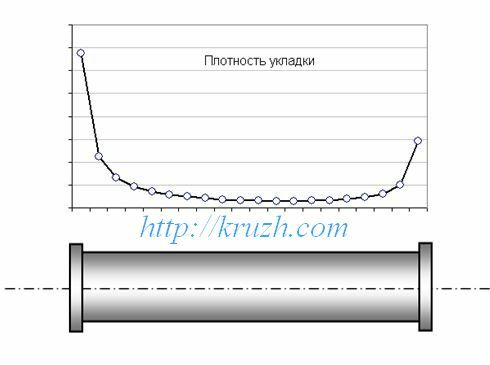 The problem of keeping thread tension constant arises because ofgrowing difference in length of untwisted threads. The greater is difference,the less is tension. The state of emergency takes place. One must stop splittingand eliminate thread sag in the emergence channel by means of additionalrotation of the spool. Of course it is impossible in this case to avoid needlesstouching the thread. Authors of the book suggest method of splitting thatprovides automatic compensation of thread sag using gravity strength. Theprinciple can be seen on the cinematic scheme (Fig.3.4). Mass of the clew 1 is enlarged up to 150 grams(0.33 pound) with a metallic ball inserted into it. The clew works as a plumb.It hangs at pulled out thread (L ? 1.5 meter or L ? 5 foots) and rotatesuntwisting the “moulinet”. The comb 2 splits the “moulinet” at three threads.The split thread moves towards the comb 3 going under the roller 4 that ispulled down with gravity strength F1. The split thread moves farther aboveroller 5 and under roller 6, both being set on the disk 7. The gravity strengthF2 turns the disk 7 clockwise. It is to be noticed that using two differentcompensators 4 and 7 is not obligatory. The matter is both realize the sameprinciple. On this reason it would be possible to change the disk compensator 7with falling roller like the roller 4. However author saved both compensators asthey are to demonstrate possible variants of tension controlling. After theroller 6 the split thread goes through a guiding comb 8 to the intermediatespool 9 set on the main roller which is rotated by hand of an operator i.e. alace maker. If tensions of three threads are equal, the balance of allstrengths (gravity and friction) takes place. The roller 4 moves up to level ofthe combs 2 and 3; centers of the rollers 6 and 7 are at the horizontalline. 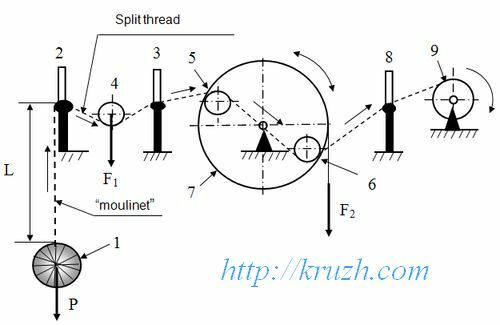 As soon as one of three threads becomes longer then other two, threadtension relaxes and the balance of strengths comes at other position of rollers.The roller 4 falls and the disk 7 turns clockwise. 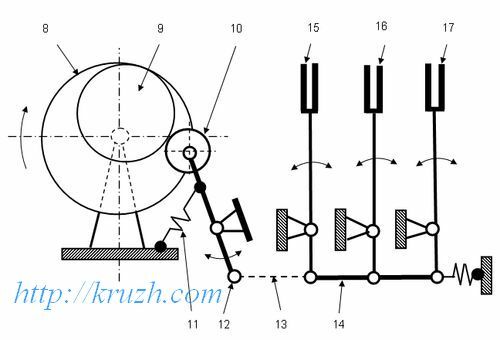 Movement of rollers stopswhen tension restores at this channel and becomes equal tension in otherchannels. When the current piece of the “moulinet” is split, it is necessaryto stop movement of disks 7 and spools 9. The pause is needed to pull the next”moulinet” piece out of the clew 1 and to untwist it. There are many methodsto work out a cinematic scheme according to the compensation principle. One ofmethods is presented on Fig.3.5 (front view). the unit 4 that containsthree disk compensators and the brake mechanism for the disks. The frame 5 isattached to the platform 1. Guiding combs 6 and 7 are set at the frame5. Three spools are set at the main roller. Ends of the roller are mountedinto the ball bearings attached to posts. The fly-wheel 8 is set at the rightend of the main roller. The wheel has a handle to rotate it (Fig.3.6, sideview). The brake mechanism of the fly-wheel consists of the pusher 9 having arubber strip at the top. The pusher falls down due to gravity when the splitprocess is going. 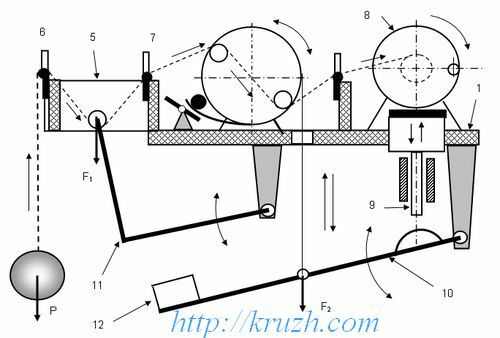 If the process is stopped the pusher is lifted and pressed tothe fly-wheel rim fixing position of the wheel. The brake mechanism of thedisk compensator contains the metallic plate that rotates around itslongitudinal axe. Flat spring is set under every disk. Rubber strip is stick tothe end of the strip. Three disks are braked simultaneously when the plate isturned pressing the springs and strips to the disks. The disks and the fly-wheelare to be relaxed to continue the split process. Tension of the thread is controlled with levers10 and 11. Both are joined to the platform 1 by means of hinges. The lever 10 ishung to the compensator disk with a flexible cord. The cord is attached to diskat the point near to the left roller. Strength F2 depends on own lever weightand weight of additional plumb 12. The lever 11 hangs with roller on the threadbetween the combs 6 and 7. Strength F1 depends on weight of the lever 11 only.Depth of the lever falling must be limited with a cord tied to the platform1. The lever 10 is set by an operator at horizontal position when the nextpart of the “moulinet” is being pulled out of the clew. The pusher 9 movesupwards and brakes the fly-wheel 8. At the same moment the disk compensators areto be braked and three levers 11 are to be lifted. When untwisting of the”mouline” is finished, the levers and the disks relax to control the threadtension. The unit 3 on Fig.3.5 is not obligatory but it proves to be usefulsince coils on the spools would be set in layers. If the unit is absent, thethread is wound as a shapeless hillock. Special guiding forks are necessary tolay the thread smoothly. Ideally three forks must do synchronous reversionarymovements along spools keeping constant speed. Alike mechanism is in any sewingmachine. It can not be repeated in domestic workshop, however it is possible todo some approximation to the ideal. 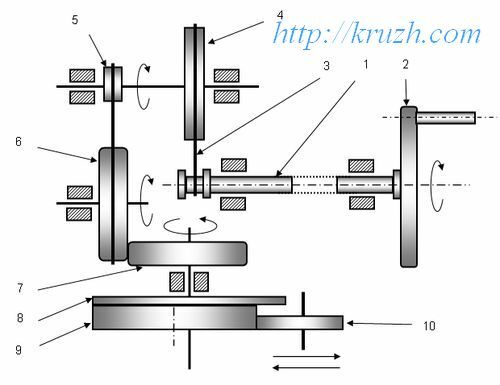 A designer-amateur is capable to makemechanism that transforms gyration movement to progressive motion of guidingforks: crank-swaying mechanism (Fig.3.7) or eccentric disk mechanism(Fig.3.8). 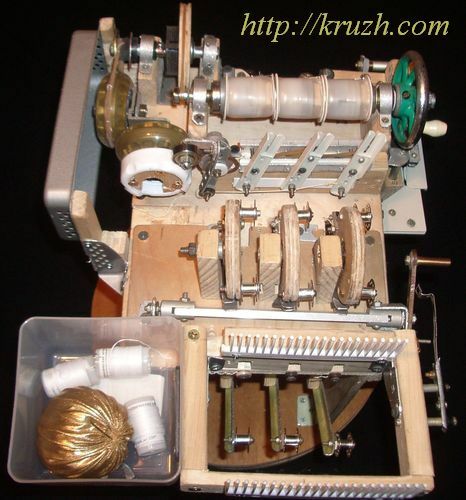 Unfortunately both mechanisms lay irregularly thethread coils along the spools. Density of coils falls from the ends to themiddle of the spool (Fg.3.9). In any case the irregularity is practically thesame in equal conditions. 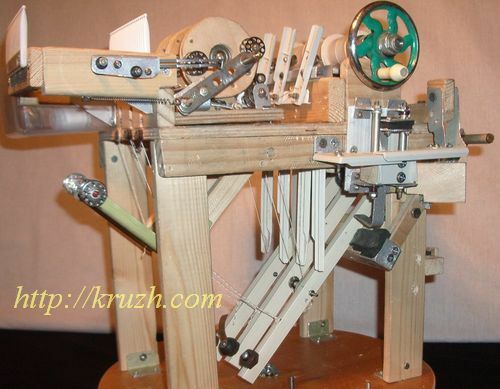 The crank-swaying mechanism proves to be more complexthan the eccentric one. Besides it has principal drawback – the crank sometimesstops at the dead points. 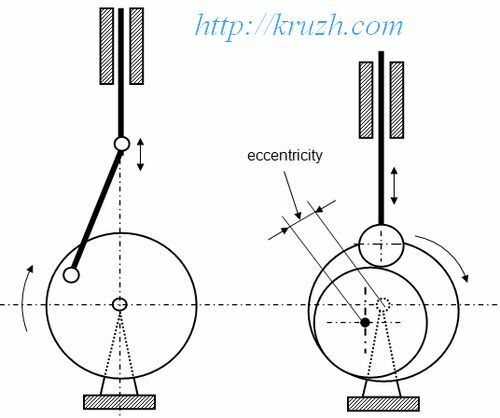 At the points it must be pushed to continue movement.The eccentric mechanism is simpler and more reliable. Moreover the form ofthe eccentric can be corrected to get more regular lays of the thread along thespool. the block of guiding forks. The reducer under consideration is notable of the small power. Onthis reason it can be produced without the special equipment using readyfabricated wheels. In amateur conditions it is easy to build the reducers of thefirst three types. 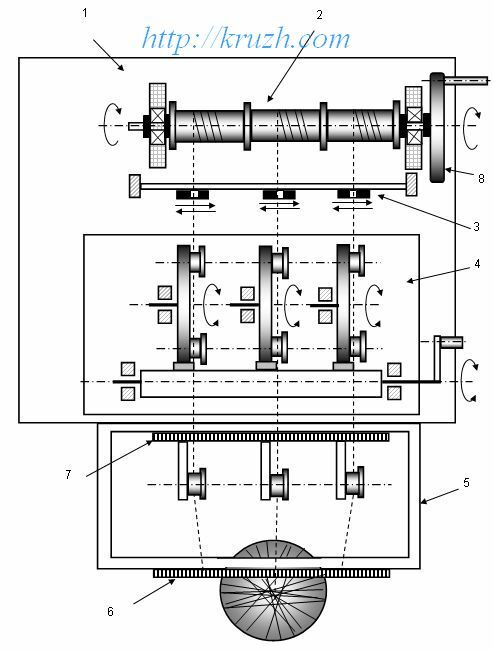 The belt transmission is the simplest in manufacture. Itis unpretentious and condones all inaccuracies of details. If ready pulleys arenot accessible, they can be cut of 10-mm ply-wood. The groove is to be made onthe rim using the round file. The rubber rings are suitable for transmission.The ring may have round, square or rectangular section. The friction pairseems to be more complex. One of the sheaves can be made of a hard material(plastic, wood, metallic). It must have an ideal cylindrical surface. It isbetter to find ready wheel. The second wheel must have a soft rim to provide agood traction. The rim can be made of rubber or flexible plastic. Theskate-board rollers would be an ideal pair. The tooth gears can be adopted fromdifferent sources including children’s design sets, big clock mechanismetc. An example of the cinematic scheme of the reducer is shown onFig.3.10. Three receiving spools are set on the main shaft1. The fly-wheel 2 is attached on the right end of the shaft. The left end ofthe shaft is bound with the sheave 3 by means of the belt 4. The sheave 5 is seton the same shaft together with the sheave 4.
to rotate the wheel 8 that carries the eccentric 9 and providereversible swaying of roller 10. The wheels 7 and 8 have the general gyrationaxe. The eccentric 9 is attached to the wheel 8. The bearing roller 10 ispressed to the rim surface of the eccentric 9 so that the rotation axe of theroller 10 reversible sways at the plate of the eccentric gyration. Two belttransmissions reduce gyration rate of the fly-wheel 2 at 40 times. Since thefriction pair formed with equal wheels, the total reduction is 1:40. Fig.3.11illustrates the transformation of uniform gyration into reversible swayingmovement. When the split threads are wound to three spools,the wheel 8 rotates clockwise keeping constant gyration rate. The bearing roller10 is pressed to the eccentric 9 with the spring 11. The eccentric 9 make theroller 10 to sway together with the lever 12. The cord 13 tied to the lever 12pulls the control rod 14 that moves levers of guiding forks 15, 16, 17. Thethreads goes through the forks and periodically change direction of movementalong the spools. The general view of the contrivance for untwisting of the “moulinet” is shown on Fig.3.12 and Fig.3.13. the box intended to save the clew; besidesthe clew there are three spools saving the split thread. the levers tied to the disk compensators with thecords.